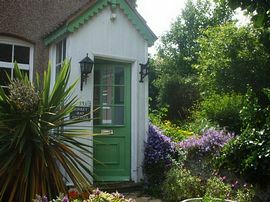 The cottage has 2 bedrooms, a through-lounge, modern kitchen and a large bathroom on the first floor with both bath and shower cubicle. Please note there is a quirky squared-off spiral staircase at the cottage, which may not be suitable for people with restricted mobility. Broadstairs has a population of around 300, 27 of them being in the trade of fishing, and the others appear to have no means of support. I am told that the area is a hot bed of smuggling. 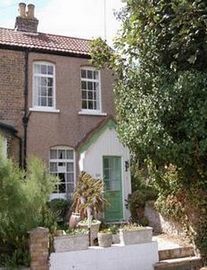 There are some lovely cottages to be admired in this extremely popular area. The picturesque and sandy beach at Viking Bay, is a few minutes walk away - about 320 metres. Albion Street has restaurants, pubs and interesting shops. There is some on-street parking and car parks nearby. The railway station is 11 minutes walk away. Due to its central location it is not at all necessary to have a car, to enjoy a holiday at the cottage. Few minutes from Viking Bay. 1 perhaps 2 well socialised dogs. There are regular trains from Broadstairs to London Victoria, London St Pancras and London Charing Cross via Ashford International and Canterbury West. From Gatwick airport take the train to London Victoria, and change there for Southeastern services. From Heathrow airport take the train to London Paddington (or the Underground Piccadilly Line into Central London) and change on the Underground for Victoria/Charing Cross. 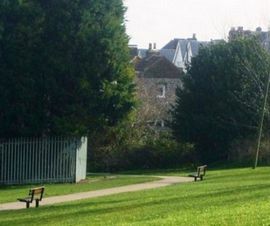 There is a short cut from the station via the steps at the top of the forecourt to Lawn Road, down Lawn Road and thence down the incline to the car park on Vere Road. Go through the gate and down the path next to the allotments - this will bring you out next to the cottage. From London take the M2 motorway coastbound towards Faversham, where it will turn into the A299. Keep following the A299 towards Ramsgate and Broadstairs is signposted. Once in Broadstairs please do not mistake Albion Road for Albion Street else you will end up in St Peters. National Express operate services from London Victoria Coach Station and these stop at Broadstairs High Street (This is the Ramsgate service). Journey time is roughly 3hrs. One of the local buses in Broadstairs is the Thanet Loop which runs through Broadstairs Town Centre in two directions; towards Margate and towards Ramsgate. The 8 goes via Margate to Canterbury. There are also frequent buses to Westwood Cross Shopping Centre which opened in 2006, and contains a variety of shops and stores, banks etc. 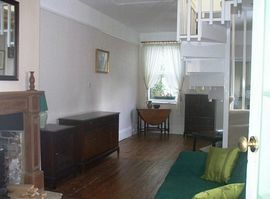 Prices vary from: £285 per week out of season to £685 for Folk week (6th - 13th August). Some short breaks are available especially out of midsummer season.